If you’ve never heard of Magnolia Pearl… you’re in for a real treat for the eyes! Magnolia Pearl (aka Robin Pearl Brown), who lives in Texas, started from very humble beginnings. With her father being an artist, and her mother a gypsy, her home was filled with creativity. Her parents were always encouraging her to creatively express herself, but it wasn’t until her mother passed away, that she took that very special first step that would launch her into a brand new career! You might remember her from her beautiful handbags… dripping with velvet & lace, or her beautiful pantaloons and other garments edged in lace. Whatever you remember… one thing that you will always do once coming in contact with Magnolia Pearl is… remember her! 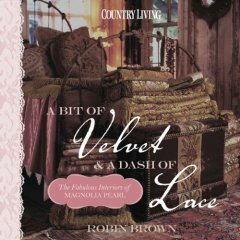 With her new book on it’s way “A Bit of Velvet and a Dash of Lace”, we will get an even bigger look into the life & home of this very creative gal! I thought you might like to get a little glance into the life & home of Magnolia Pearl! ** Don’t forget… the next big segment will be “Creative Spaces – Where Creativity Rules”, in which we will share the special spaces that allow your creativity to shine! We want to highlight the ways you organize, how you decorate your creative space, beautiful shelves, etc. Please feel free to send in your pictures, flickr links, and blog address if you would like to participate. WOW! I LOVED, LOVED this segment Pearl!! i found her a few weeks back when she started her blog. She has a very unique style and I’ve been looking forward to the release of the book. what a great segment! Thanks for sharing. I came by you by way of Manuela. Magnolia Pearl is featured in the April issue of Country Living magazine. I love Magnolia Pearl’s style! It has given me inspiration for my wedding. I want to do a sort of Victorian – Hippie – Fairy – Country theme and I have gotten great ideas from her work! Thank you:) Also, that “sac – religious” segment is hilarious. I love this book. I have magazines with Magnolia Pearl featured. It is so inspiring. I love her ideas and she has really inspired me. Thank you for giving me a taste of your awesome ART…but again all happens so far away…which to represent you in South Africa,if you like!? love it….love it….love it……..i am a Texas girl and feel so connected when i see all these absolutely beautiful pictures. it is in my soul. my girlfriends tell me i am the twin to the blonde girl with long braids…i want to be a part of this wonderful friendship the girls connect with. tears come to my eyes…i feel this is where i need to be…nothing like being a true Texan.